This is the first in a series about an artist whose life was shaped by her childhood in the Ray-Kearny area. When Jeanmarie Simpson was 12, she regaled her seventh grade classmates with a performance piece about the adventures of “My Fair Lady” heroine Eliza Doolittle on Christopher Columbus’ flagship. Now, the 52-year-old writer/actor blends story, historical research and performance to tell the stories of unsung women past and present in a passionate plea for peace and social justice. Simpson’s path to artistic activism has taken her from that long-ago classroom in Toronto to a series of one-woman shows about women as diverse as Jeanette Rankin, the first woman elected to Congress, and Mary Dyer, hanged in 1660 for being a Quaker, with stops along the way to direct a regional theater company, write screenplays and appear in numerous stage and screen productions. Simpson comes with a resume that speaks of serious art. She’s been the co-founder and artistic director of two theater companies and associate artist and project specialist for Kore Press, an activist publishing concern focusing on women writers. She lists a repertoire of regional and off-Broadway performances that range from Camelot to Hamlet. She’s done national and international tours of her own solo shows. But a closer look reveals a devotion to activism over art: although she’s retired from a number of the organizations intended to support artists: The Screen Actors Guild, the Dramatists Guild of America and others, she remains a lifetime member of the Women’s International League for Peace and Freedom. Is Jeanmarie Simpson a writer who performs? An actor who writes? Simpson’s work defies labels – except for the one she’s created for herself: “artivist” – an artist whose work is dedicated to peace and social justice. And as Simpson herself puts it, events since childhood have shaped the “trajectory” of her life, aiming her toward a commitment to activism through art. Ray, Arizona is a casualty of the mining industry, a tiny community swallowed by copper giant Kennecott Mining Company in the mid-1950s. Jeanmarie Simpson was born in Ray – when it was still a town – to a mining engineer father and a Brooklyn-reared Venezuelan mother. When she was two, the family was relocated to nearby Kearny, a settlement created by Kennecott to accommodate the residents of Ray and other communities displaced by the mines. Those childhood days in Ray and Kearny offered an early exposure to other cultures and a keen awareness of separateness and social inequalities. In 1970, Simpson’s family moved to Toronto – a hotbed of social unrest and ideologies that introduced Simpson to art, theater and new ideas. That year the Front de Liberation du Quebec kidnapped the British Trade Commissioner and Quebec’s labor minister. Prime Minister Pierre Trudeau suspended civil liberties and imposed martial law. Canada embraced American draft dodgers but hated American expansionism and militarism. 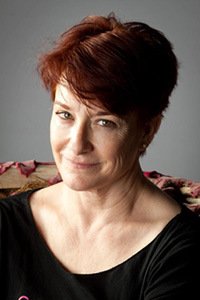 Although Canada embraced American draft dodgers, many Canadians despised American militarism, and Simpson and her brothers were greeted at school with calls of “Yankee, go home!” Culture shock and political turmoil, along with opportunities to explore her own gifts as a writer and performer, opened new doors for Simpson, who credits those years in Canada – and her seventh-grade recreation of Eliza Doolittle – for changing the course of her life’s trajectory yet again. Simpson returned to the States at 15, eventually settling in Nevada near her family. She’d been married and had a child, and found theater work in a variety of regional venues. But a job outside the world of theater pointed the way toward activism: Simpson found work as a coordinator of special projects for the Consolidated Agencies of Human Services in Hawthorne, Nevada. Here, working with the needy and disabled, she saw the growing gap between the wealthy and the poorest Americans and realized the need for activism, especially on behalf of women and children. By 1984, as President Ronald Reagan was running for re-election, she knew she had become a pacifist and peace activist.